The Holy War rivalry continues as these schools met every year from 1922-2013 with Utah leading the overall series 54-31-4. Utah has won five of the last six SU, including the last meeting, 20-13 (+6.5) and covered eight of the last ten. This is BYU’s sixth appearance in this bowl (3-2 SU/ATS) but first since 2009. Utah beat Colorado State, 45-10 (-2.5) in this bowl last year and is making their fifth overall appearance (3-1 SU/2-2 ATS). Utah head coach Kyle Whittingham is 7-1 SU/6-2 ATS in bowls, while BYU head coach Rocky Mendenhall accepted the head coaching gig at Virginia, but will coach the bowl gm & is 6-4 SU/ATS in those. In head-to-head meetings, Whittingham is 6-3 SU/7-2 ATS. After three straight 8-5 seasons, a win here would give BYU double-digit wins for the first time since 2011. The Cougars had just five returning starters on defense as they lost five of their top seven tacklers, but Mendenhall showed how valuable he was as they enter with an above average unit. They went 2-2 to open the season despite playing Nebraska, Boise, UCLA, and Michigan (three on the road & ‘dogs in all four) & losing starting quarterback Taysom Hill and starting running back Jamaal Williams. The Cougars then rolled off seven wins in eight games with their lone loss coming in Kansas City versus Missouri. Utah entered the season full of hope as they had 14 returning starters and five conference home games. This was their best team since joining the P-12 and they were 6-0 and ranked No. 3 before losing at USC. The Utes then won back-to-back games, but closed the season losing two of three. They placed a total of seven players on the first or second All-Conference team with five coming on defense/special teams. A win here would give them a double-digit win season for the first time since 2010, which would also be the first time since joining the P-12 as they finished tied with USC for first place in the South. 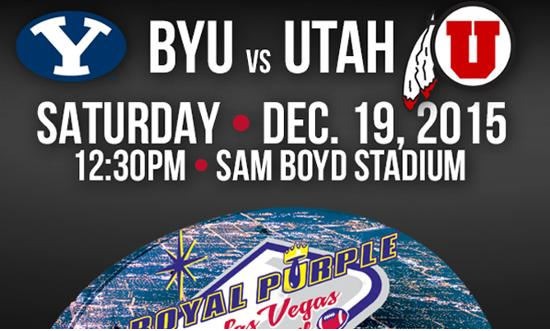 BYU was upset that Utah ended the series, but both teams want to win this game badly. BYU was plus 70 yards per game on the season, while Utah was plus 12 yards per game, but versus a tougher schedule. BYU has an edge on offense with Utah running back Devontae Booker out (knee), but the Utes have the edge on defense and special teams. Bookers replacement is Joseph Williams, who’s rushed for over 100 yards in two straight games, was a second team Junior college All-American last year, and has 4.38 speed.